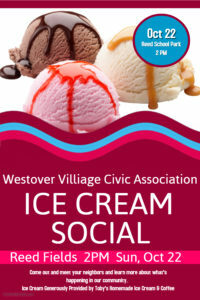 Come join your friends and neighbors for an ice cream social Sunday, October 22 at 2 pm on the field next to Reed School. Kids of all ages are welcome to attend in costume, though it is not required. This is our main social event of the fall as we will not organize a Halloween parade this year. We will have our next civic association meeting on Wednesday, November 15 at 7PM in the large conference room at the Westover Library. We will discuss the upcoming renovations and conversion of the Reed School to an elementary school, provide an update on affordable housing and other topics of interest to the community.